Flannel is a light to heavyweight fabric woven as a plain or twill weave that originated in Wales. Some sources claim the name is derived from the Welsh word "gwalen," which means literally a piece of clothing or material made of wool. Another possible etymological origin of the word is from the Old French "flaine," which refers to a blanket or coverlet. Flannel is finished with napping to increase its insulating properties. After the fabric is woven, it is brushed so that the staple fiber ends are loosened from the weave to form a fuzzy surface. Napping also contributes to the soft hand of the fabric. Flannel may be made from wool, cotton, synthetic fibers, or blends that incorporate a synthetic fiber with a natural fiber to add to the overall strength of the fabric and increase resistance to abrasion. Flannel-back satin refers to a type of silk satin that has spun yarns in the weft (crosswise yarn) and is brushed or napped on the back. Cotton flannel is made with loosely spun filling yarns to ensure a dense nap. It may be napped on one or both sides. 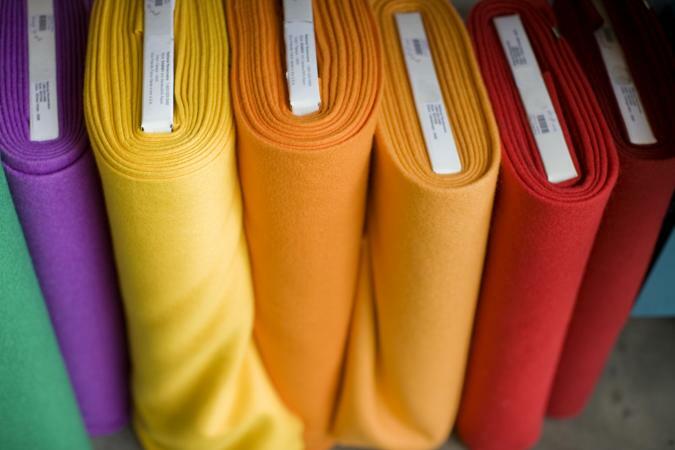 After the untreated fabric or greige goods are napped, the fabric is dyed or printed and finished again by brushing or being run through the napping machine a second time to restore the nap. Variations of cotton flannel include outing flannel, Canton flannel, dommet flannel, flannelette, and suede cloth, which is shorn after napping. Outing flannel, which is heavier than flannelette, is used for lightweight jackets, shirts, dresses, and upholstery. Flannelette is used for bedding and sleepwear. Wool flannel may be made of either worsted or woolen yarns, the latter producing a denser nap. It is typically napped on one side only. Flannels made of woolen yarns are usually plain woven, and those made of worsted yarns are usually twill. Worsted flannel is lighter and firmer than woolen and will wear better. Pure wool flannel is a favorable fabric for tailoring because it shapes easily with the use of steam and heat. Wool flannels are used to make trousers, skirts, suits, and coats. French flannel is a variation of wool flannel that has a more fluid drape. Gioello, Debbie Ann. Profiling Fabrics: Properties, Performance and Construction Techniques. New York: Fairchild Publishing, 1981. Humphries, Mary. Fabric Glossary. 3rd ed. Upper Saddle River, N.J.: Pearson Prentice Hall, 2004. Linton, George E. The Modern Textile and Apparel Dictionary. 4th ed. Plinfield, N.J.: Textile Book Service, 1973.